To hang a ceiling chair, you’ll usually need just a single anchor point. Here’s a quick overview of the four best suspension sets for the hammock and hanging chairs on the market which you can easily install and relatively quickly attach your hanging chair to the ceiling. This high-quality swing hanger is a perfect choice to hang your hammock chair “swing style” with two suspension points on our porch or your living room. This is certainly not the cheapest swing hanger you could find, but it is a high-quality product, very solid, easy to fix up and completely silent. You can leisurely enjoy the midnight swinging without disturbing the neighborhood, cause this swing hanger works like a charm with no squeaks, no rubbing and no plastic ring that breaks down after a couple of days. Thanks to modern ball bearings technique, the suspended snap hook runs like on rails, which allows constant movement up to 60 minutes nonstop and beyond. The excellent rolling feature guarantees a maximum of smooth motion and pure relaxation without any background noise. You can choose between premium zinc plated or stainless steel hanger, which is seawater proofed and perfect for the beach or in swimming pools with chlorine-containing air. Keep in mind that you are buying individual hangers. For a porch swing or any other swing chair with two suspension points, you need to purchase 2 of them. If you want to hang your hanging chair “pivot style”, this suspension system is the best one. It is suitable for hammock chairs with a spreader bar or basket hanging chairs which require only one anchor point. This ball bearing swivel hook lets you rotate freely in your swing chair all-around full circle, and ensures the cords do not chafe allowing free rotation in any direction. Byer of Maine is American distributor for their partners, Amazonas from Germany. They are well known in Europe for their top-quality, original cotton hammocks and hanging chairs and accessories. 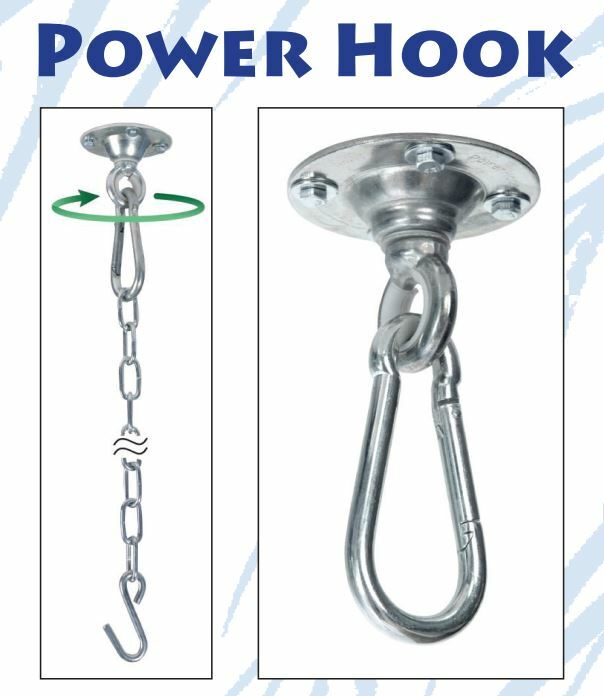 This ball-mounted ceiling hook with an extension chain for adjusting the height should give you many years of excellent service in your home when used for quiet relaxation. Thanks to modern bearing technique, this suspension system hook assures a safe hanging spot for your hanging chair, whilst providing the flexibility of rotating a full 360 degrees. Made with industrial bearings for safe swinging. You don’t need to get springs. It comes with the swivel hook and chain. Only for use in concrete! For wood, you’ll need an adapter available here.This adapter is designed to allow for the Swivel Hook to be mounted using 1 1/2″ wood framing. 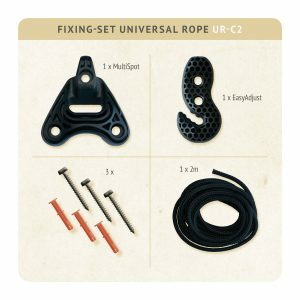 This universal suspension set by La Siesta, one of the leading suppliers of high-quality hammock chairs from Latin America, is excellent for flexible installation on a wall, a ceiling, beams or trees. The Smart Hook allows easy modification of rope length. The hook can be simply fixed using common tools, and is suitable for attachment to a lot of different surfaces. Its three-sided shape with three holes guarantees optimal weight distribution. This set is very practical, weatherproof and resistant to UV-rays, so it is suitable for indoors and outdoors use. All components are 100% “Made in Germany”, which is a brand promise for excellent, high-quality products. Hook: fiberglass reinforced polyamide; rope: heat set polyester. Easy installation. Enables swift suspension and demounting. Working principle for a ball bearing; red dots show the direction of rotation. It is cageless, but a ball is a non-contact ideal figure. 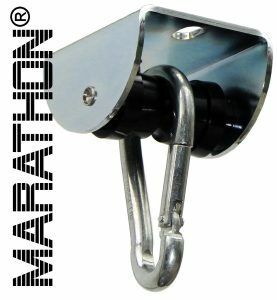 The Marathon Hanger and the Power Hook have integrated ball bearings, which reduce friction between moving parts. 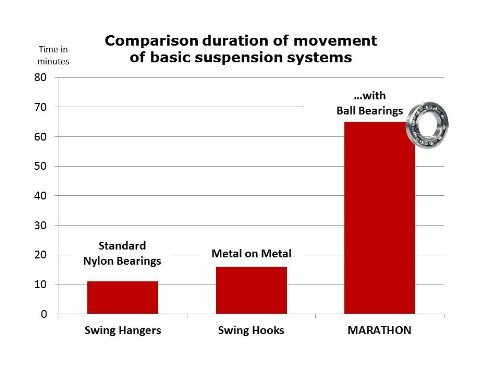 The advantage of ball bearings is reflected in a longer duration of movement and in a longer lifetime. The fidget spinners for example, which uses ball bearings to allow it to spin, are toys designed to spin with little effort. 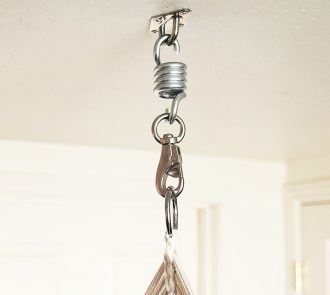 This stainless hanging chair suspension kit includes all you need to hang any hammock or swing chair reliably from any usual ceiling joist or wood beam or any other overhead surface. Included in the pack are a spring and a swivel that allows 360 degrees of rotation without any tangling or twisting chair rope so that hammock chair never comes undone from the ceiling. A heavy duty 500 lb spring provides bounce and extra level of comfort to any swing. We haven’t tested this suspension system personally, but as there is no certificate for the product, we would strongly advise, to be skeptical about spring hook capacityof over 500lb. Also, don’t mix up weight and the spring capacity. Even if the spring has a capacity of 500 lb, this doesn’t mean that the set itself can hold more than 300lbs. The manufacturer is Arbor Hammocks. As this is the only product offered by them, we assume the product is made in China. spring is hard, which means, it doesn’t stretch and does not relieve stress, even when a nearly 200 lb person sits in the chair. swivel is metal on metal so it doesn’t rotate easily as this is the case with the Power Hook by Byer of Maine, which uses the bearing technique. The chain or rope will twist more easily making it useless. Conclusion: According to the review rating on Amazon, hundreds of customers are satisfied with this product, so if you need a low budget solution, the suspension kit might work for you. Otherwise, we recommend buying the Power Hook reviewed above. This was the best hanging chair hardware that will help you to attach a hanging chair to the ceiling. Anyway, always follow the manufacturer’s instructions for installation and safety when fixing the suspension set. The installation must be done by a competent person and to a load-bearing material. Check all individual parts for signs of damage regularly. Should you find signs of damage, replace the respective parts immediately. An extraordinary exposure to weather and intensive use will bring about wear and tear faster. Never exceed the specified maximum loading capacity of the product. In the case of new installation, before using your new ceiling chair, be sure to test it for safety.